While I usually do quite a bit of shopping on holiday weekends since the sales are so good, this past weekend I did significantly less actual buying and made more of a summer wish list. After being in my new place for a over a month, I used this long weekend to finish up some home projects and finally took some time to decorate and catch up on my giant stack of magazines. I hope everyone was able to enjoy some relaxing time this weekend! 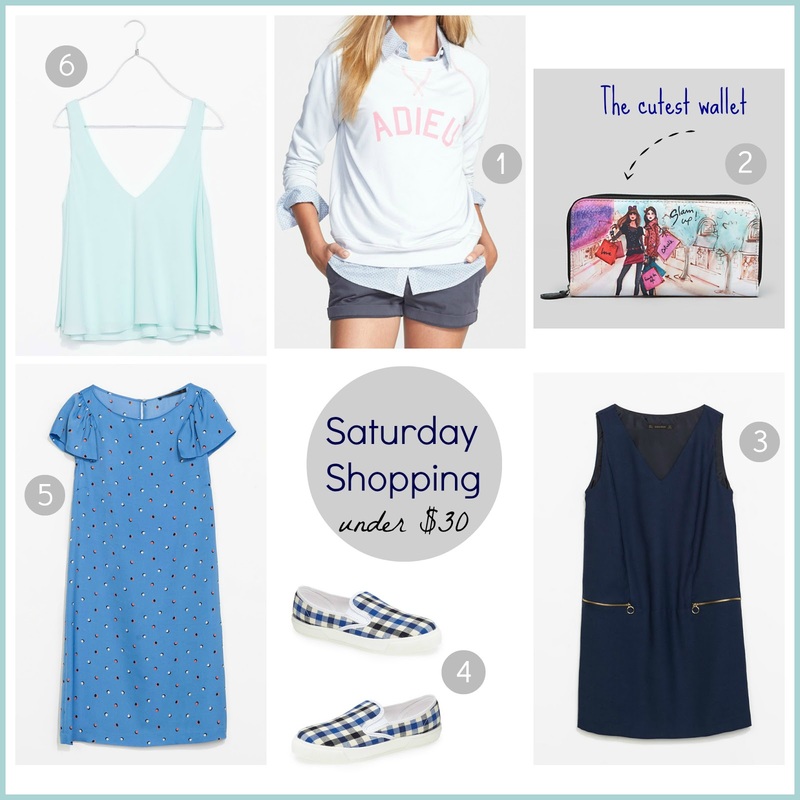 My Saturday shopping came with some unexpected sales I spotted along the way and I wanted to share a few favorites with you before they are gone! 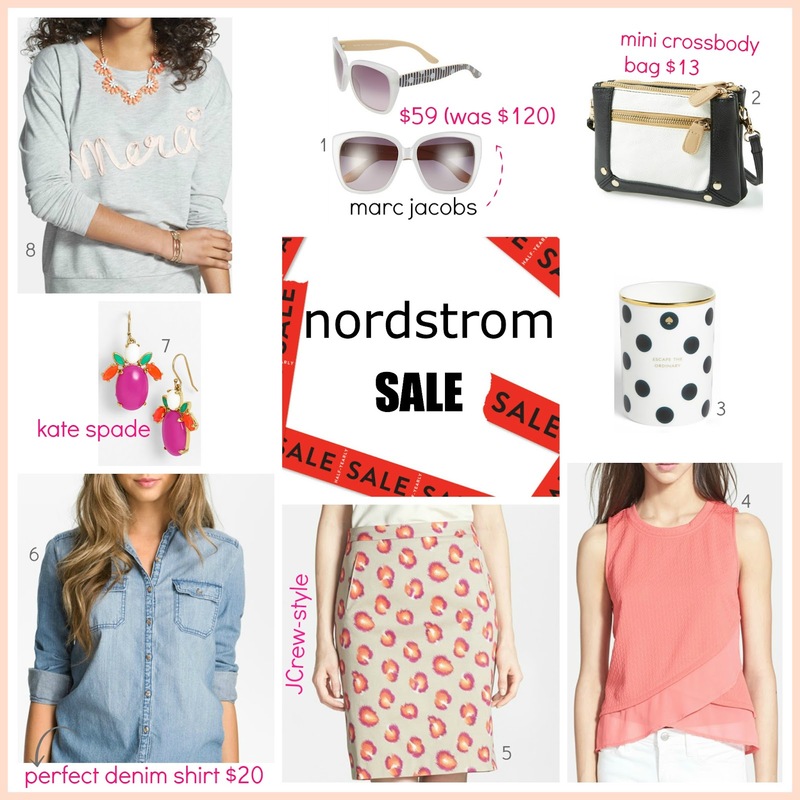 With the Nordstrom half-yearly sale arriving this Wednesday, I always scout out the store to see what they might mark down early and it didn't disappoint. They are also doing some "pre-sale" on merchandise, so get to the store early if you want a jump start. They also price-matched Topshop's 30% off sale on selected summer items (yay for another pair of what has become my favorite pair of shoes!) Zara's big sale doesn't start until late June, so when I saw two racks of sale, I headed straight for them! The wallet I had my eye on is not only on sale, but an additional 25% off! Bloomingdales Extra 25% selected sale/clearance using EXTRA25 + sign up to be a loyalist for free shipping on all orders! One of my favorite color combos to wear in the summer are shades of blue paired with pops of orange. Maybe because my uniform usually consists of denim, so I can easily add that splash of color without being over the top. Even though I am in the middle of a heatwave, I still love lightweight sweaters to throw on while I am on my imaginary beach, I mean the mall of course. Yes, that sweatshirt dress from the Gap may be on the heavier side for this weather, but it's not hot all the time, especially if you are working in air conditioning. One again, I'll be adding new sunglasses to my growing collection, because you cannot go wrong with Forever 21 sunnies. While I usually like to keep items under thirty dollars, I couldn't resist adding these Jessica Simpson wedges into the mix after seeing them for full price at Macy's! 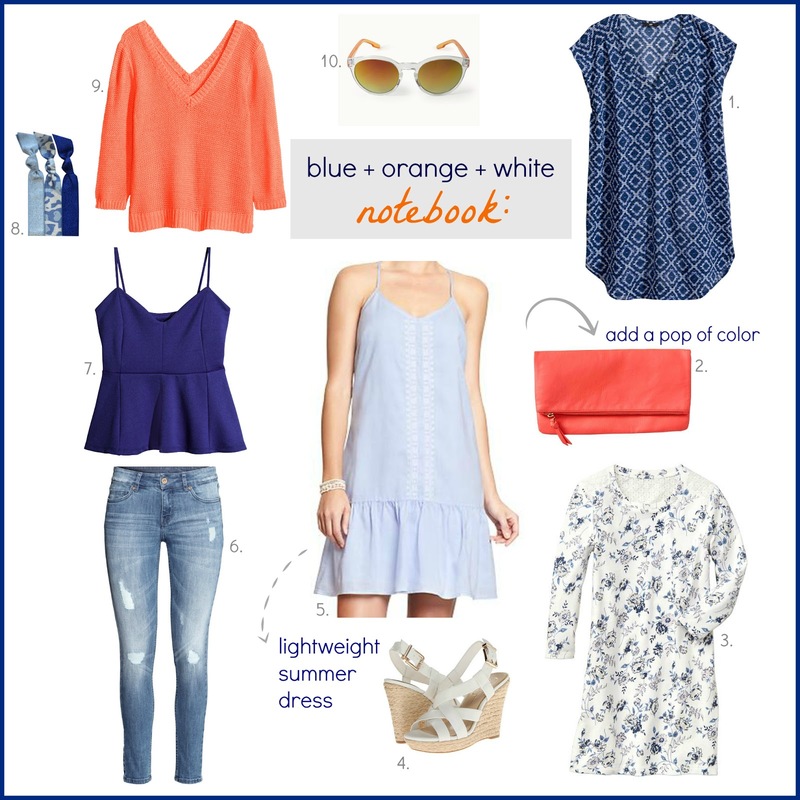 What do you think - do you like to add a pop of orange to a blue color palette? I did so much shopping this weekend, I wanted to share all of my finds with my you! 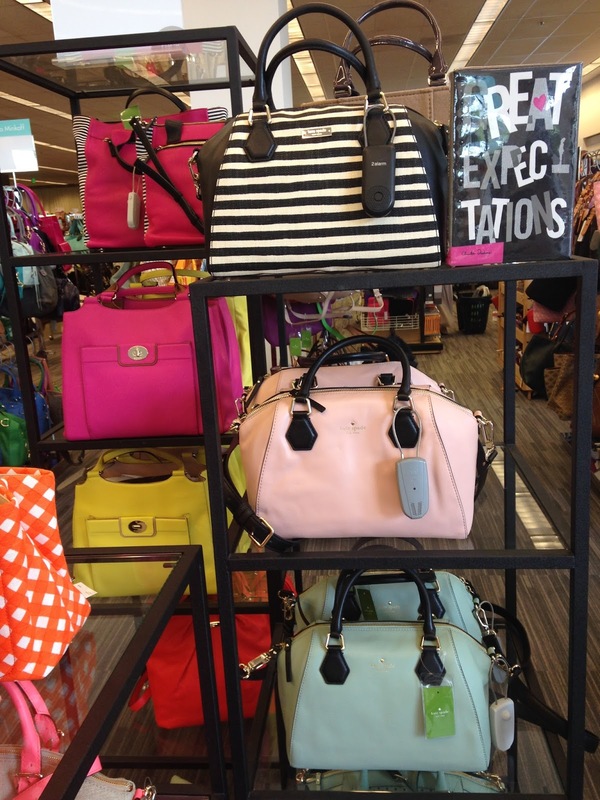 However, I also took so many pictures, I need to separate them into two posts, so I'll first start with all of the amazing handbags from Kate Spade at Nordstrom Rack. I hope you enjoy doing a little shopping with me! 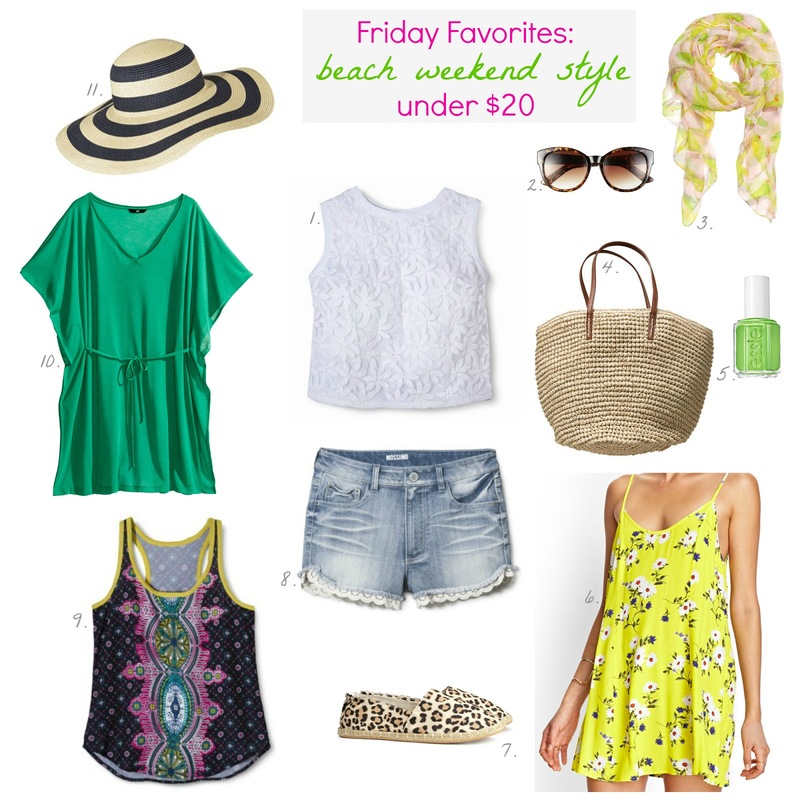 Since I live in sunny Los Angeles, I'm always shopping for beach attire, even though I rarely step foot on the sand. 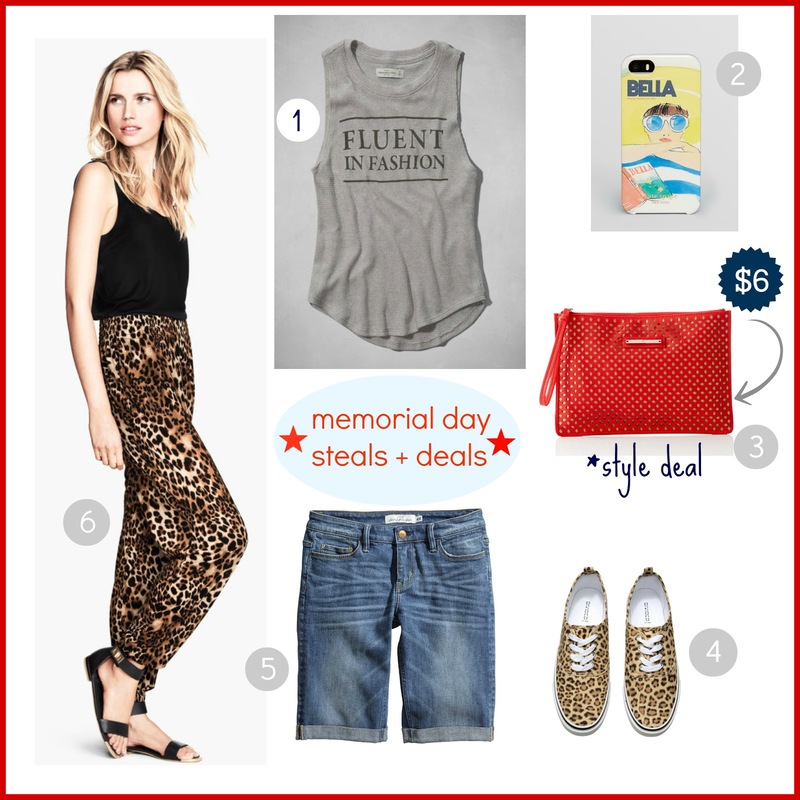 It's just another excuse to do a little shopping for some inexpensive summer essentials. 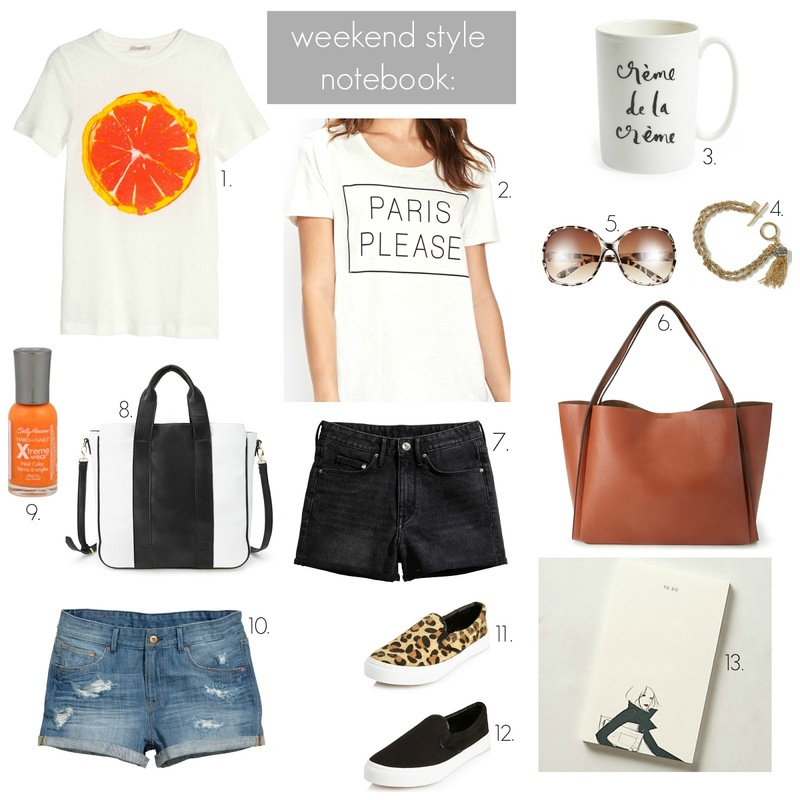 If you are venturing out for a weekend getaway, I found affordable items you can pack up, look cute and not spend time worrying about getting something ruined from (gasp!) sand. I've been seeing more shades of blush again on my shopping rounds and I love these beautiful shades of pinks, nudes, and peaches just in time to wear on Mother's Day or attend a spring wedding. It's such a romantic look and very Gatsby-esque, perhaps I'm also influenced by my recent third viewing of the movie. Either way, it's a nice color palette to have in your wardrobe. Wear these feminine pieces with some distressed denim for a casual everyday look. Do you like this color - how do you wear it? 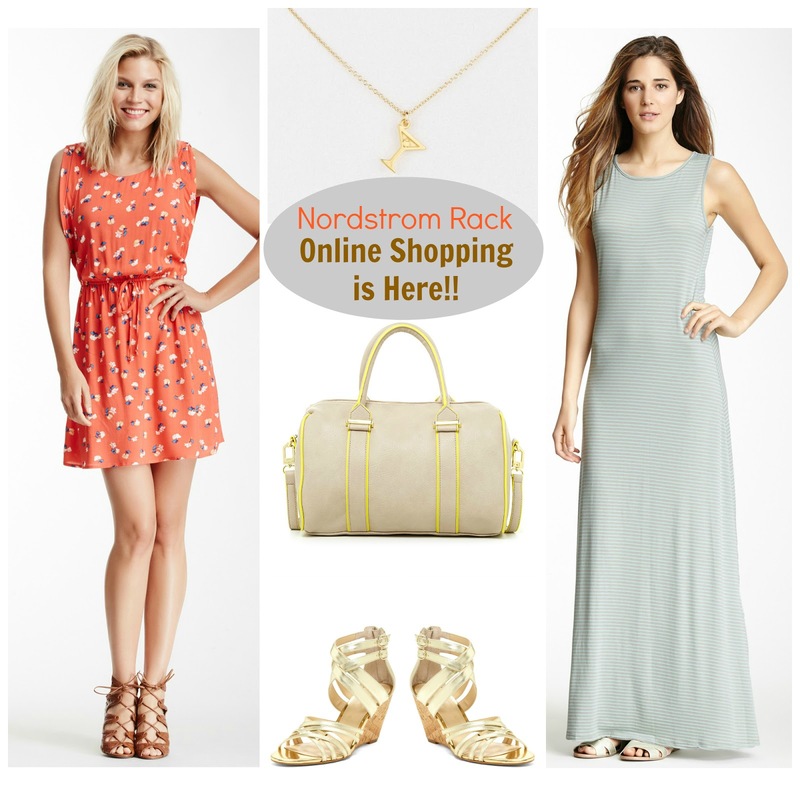 This Monday is bringing big news to online shopping today with the newly launched Nordstrom Rack site! Previously, you could buy items that stated "Nordstrom Rack" on Nordstrom's main shopping site, but they were just random items that came up when shopping sale items. The new site also has a tab to shop their popular semi-flash site Hautelook. I can barely contain my excitement for seeing all the brand names and super low prices that go along with it. While I would love to share more of my favorites with you, items are selling out fast since their announcement on their Facebook page. I'm pretty sure the few items I am sharing could be sold out by the time you read this. Well, I'm off to do some shopping "research"... for my readers of course. 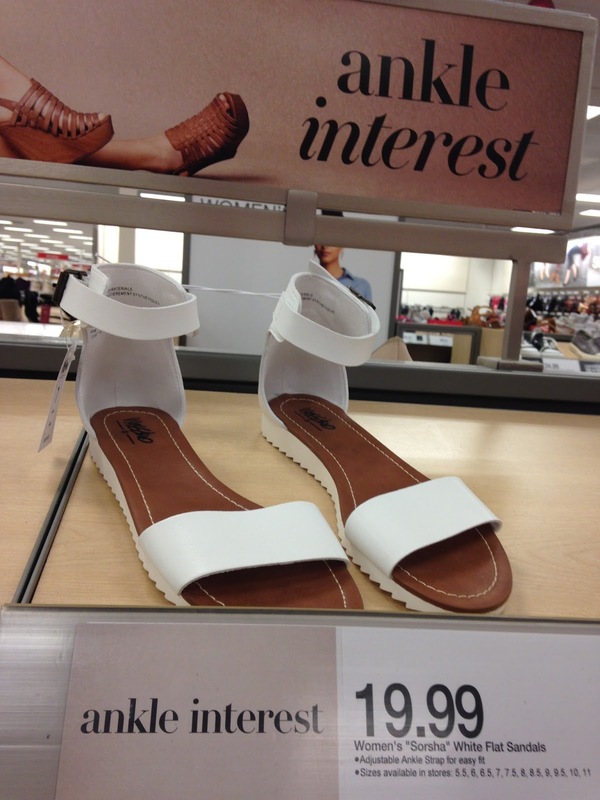 What do you think of shopping Nordstrom Rack online? There is also a tab for "clearance" for even more savings. Free Shipping on orders of $100 or more, plus it can be combined with items from Hautelook! Most items can be returned to a Nordstrom Rack store, there are some exceptions. View the entire return policy here and read carefully before you make a purchase. I'm always a bit embarrassed how often I am actually at Target. Although it does has it's advantages since most of shopping trips can be short stops to look at the new arrivals and this week has brought so many cute new shoes and today they are even on sale! Perfect timing to pick up a few summer sandals that looks designer chic! All of these pictures were taken on Saturday before the big sale today, so all shoes are 20% off! Los Angeles is in the middle of a major heat wave this week and it has me wishing for a nice breeze on a tropical beach...or at least temps under 90 degrees! There was even a power outage to go along with the 100 degree weather, so I'm stocking up on shorts and plenty of summer hats to protect my pale skin. 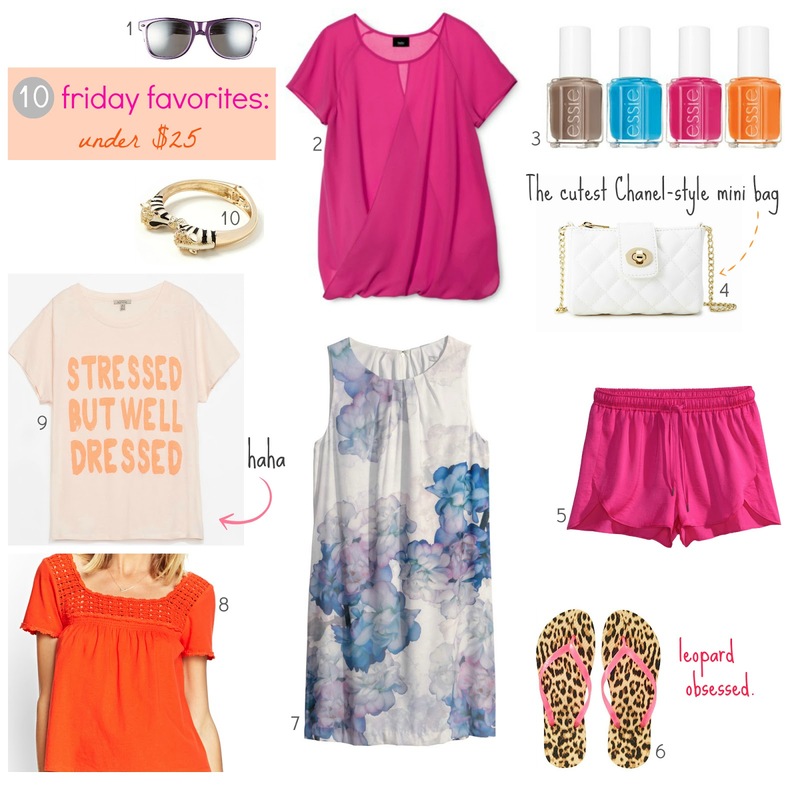 These are all items I've seen this week (with the exception of the new Essie neon collection, I want every shade!) and the six dollar tank at H&M is something I'll be buying in every color. What's your favorite vacation item?